32 www.coalage.com July/August 2018 fuels and lubes continued thickness and adhesion needed to provide optimum protection. The approach sug- gested by most lubrication experts is to ap- ply this type of grease in smaller quantities at more frequent intervals, and if possible, take frequent temperature readings on gear surfaces to confirm that the layer of lubri- cant is adequate and evenly distributed. When applied correctly, enhanced gear lubes can offer a number of attractive advantages that include overall material and energy cost savings, a cleaner and saf- er work environment, and in some cases, the power to heal. 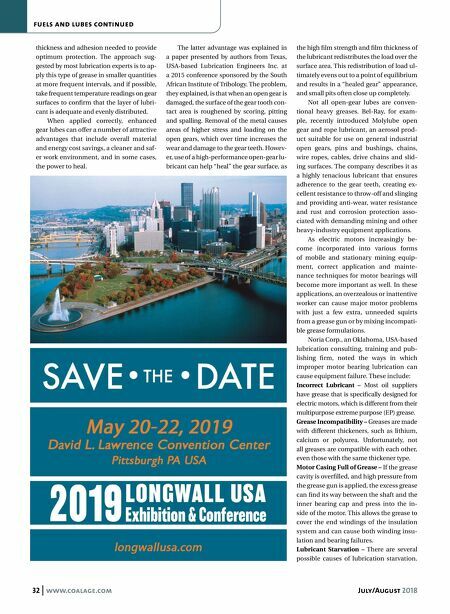 The latter advantage was explained in a paper presented by authors from Texas, USA-based Lubrication Engineers Inc. at a 2015 conference sponsored by the South African Institute of Tribology. The problem, they explained, is that when an open gear is damaged, the surface of the gear tooth con- tact area is roughened by scoring, pitting and spalling. Removal of the metal causes areas of higher stress and loading on the open gears, which over time increases the wear and damage to the gear teeth. Howev- er, use of a high-performance open-gear lu- bricant can help "heal" the gear surface, as the high film strength and film thickness of the lubricant redistributes the load over the surface area. This redistribution of load ul- timately evens out to a point of equilibrium and results in a "healed gear" appearance, and small pits often close up completely. Not all open-gear lubes are conven- tional heavy greases. Bel-Ray, for exam- ple, recently introduced Molylube open gear and rope lubricant, an aerosol prod- uct suitable for use on general industrial open gears, pins and bushings, chains, wire ropes, cables, drive chains and slid- ing surfaces. The company describes it as a highly tenacious lubricant that ensures adherence to the gear teeth, creating ex- cellent resistance to throw-off and slinging and providing anti-wear, water resistance and rust and corrosion protection asso- ciated with demanding mining and other heavy-industry equipment applications. 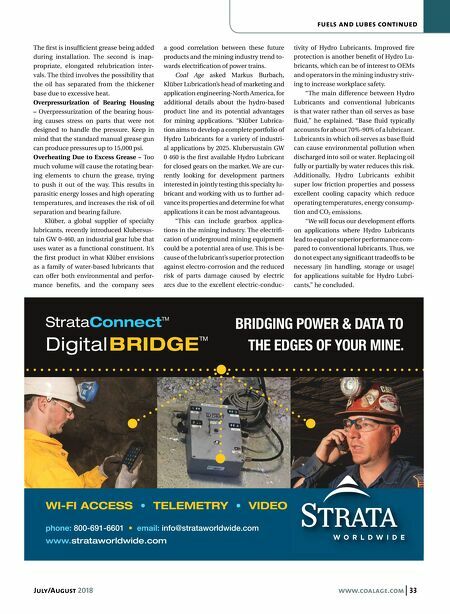 As electric motors increasingly be- come incorporated into various forms of mobile and stationary mining equip- ment, correct application and mainte- nance techniques for motor bearings will become more important as well. In these applications, an overzealous or inattentive worker can cause major motor problems with just a few extra, unneeded squirts from a grease gun or by mixing incompati- ble grease formulations. Noria Corp., an Oklahoma, USA-based lubrication consulting, training and pub- lishing firm, noted the ways in which improper motor bearing lubrication can cause equipment failure. These include: Incorrect Lubricant – Most oil suppliers have grease that is specifically designed for electric motors, which is different from their multipurpose extreme purpose (EP) grease. Grease Incompatibility – Greases are made with different thickeners, such as lithium, calcium or polyurea. Unfortunately, not all greases are compatible with each other, even those with the same thickener type. Motor Casing Full of Grease – If the grease cavity is overfilled, and high pressure from the grease gun is applied, the excess grease can find its way between the shaft and the inner bearing cap and press into the in- side of the motor. This allows the grease to cover the end windings of the insulation system and can cause both winding insu- lation and bearing failures. Lubricant Starvation – There are several possible causes of lubrication starvation.